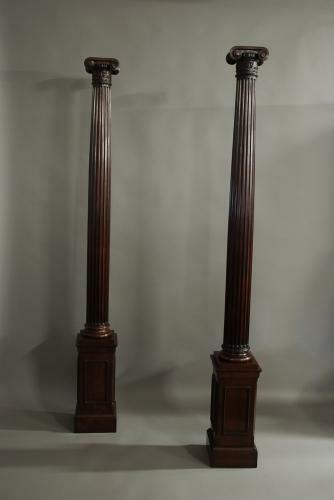 An early 19th century decorative pair of walnut Ionic columns of fine quality in the Classical form. These columns have capitals of Ionic design characterised by volutes which are spiral scroll designs that form the basis of the Ionic. The cap also has an egg and dart design between the scrolls, underneath are carved anthemion and scroll designs with a turned collar leading down to a fluted column and terminating on a later architectural base (possibly added late 19th/early 20th century). These columns are in very good condition and can go straight into a home.